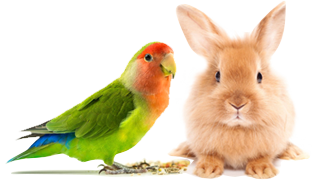 Your Avian Vet – Pet Birds by Lafeber Co.
Avian Medicine: Why Is It $O EXPEN$IVE? It was many years ago in early afternoon, during that wonderful little lull that sometimes happens in a normal day of a busy veterinary practice. I had just finished my lunch, and was sitting at the front desk. When the phone rang, I answered. “My daughter’s parakeet has been acting funny for a few weeks, and she thinks it’s sick. I got some of that bird medicine from the feed store and I’ve been putting it in his water, but now he’s on the bottom of the cage. Every time I talk to bird owners, I emphasize the importance of having one’s pet bird checked out yearly by an avian veterinarian. Indeed, I often refuse to work with a parrot with a so-called “behavior problem” until afterthe owner has had the animal thoroughly checked out. After all, many alleged psittacine delinquencies are instead manifestations of physical problems. All my birds love Avi-Cakes and it is their base diet, but they always taste better when you stand on them! This is Misty, who unfortunately passed away in 2004. She couldn’t wait for the Avi-Cakes to make it to the food bowl and always insisted on commandeering them! I’ve had Scully on many types of food and not until I discovered the Lafeber Nutri-Berries did he willingly eat without tossing food back at me. So, for I’d say the last 20+ years, his diet has consisted mainly of the Lafeber nutri-berries. He’s healthy, beautiful and I hope he continues as a member of my family for many more years to come. Your wonderful and healthy products are what’s keeping my 24 year old gray cockatiel alive and well. He’s been eating Lafeber’s foods since he was weaned from his parents! He particularly loves his Tropical Fruit and Sunny Orchard Nutri-Berries. Fruit Delight Avi-Cakes are eagerly devoured also! Thank you for all you do! Here’s hoping my bird and I will continue to do business with Lafeber’s for many more years to come! Clio is a 15-month-old Double Yellow Head Amazon. One of her favorite treats is Nutri-Berries. When they are included with a mixture of other foods, they are always her first choice to be eaten. She enjoys the Nutri-Berries literature almost as much as the Nutri-Berries themselves. As with any informed consumer, Clio wanted to be certain that only natural ingredients were in her Nutri-Berries.Thanks for helping to keep Clio happy and healthy.